Andy Riley is an award-winning comedy writer, accumulating accolades for his role in co-writing Veep and Gnomeo and Juliet, as well as writing a host of best-selling cartoons, including The Book of Bunny Suicides, and the comic strip Roasted in The Observer Magazine. 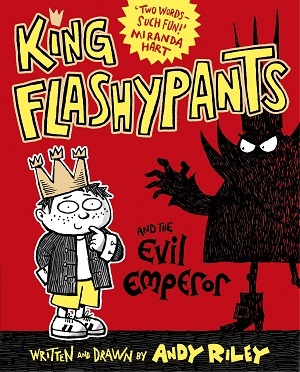 His latest foray into children’s publishing is the outrageously funny King Flashypants and the Evil Emperor (and you can read my review here). To inspire you to do the same, Andy has kindly agreed to share his serious tips for writing something funny. Although I am fairly new to children’s books, I am an old hand at drawing cartoons and writing comedy scripts for TV and film. So old that 13 September 2016 marks my Silver Jubilee. The very first time I got something broadcast was on that date, in 1991. A spoof vox-pop about joy-riding for the Radio Four’s topical sketch show Week Ending. One minute of material, split two ways with my writing partner Kevin Cecil: that bagged me £14. Yes, I knew then that I was on the big script-writing money train. Give yourself the freedom to have a lot of bad ideas. This is important. If you have one idea, then immediately try and work out whether or not it is any good, it’s like driving with the brakes on. You’re going to keep questioning your thoughts as soon as you have them. Let yourself run free for a bit. Think up ten or twenty ideas around that same theme. Then change your mental hat, enter ‘critic’ mode, and pick out which one of your ideas is any good. The ratio of bad ideas to good ones is something like 10 to 1. Sometimes a bit less, sometimes a bit more. Have a go at doing it in collaboration with a friend, or at least someone that you can stand being in a room with for a couple of hours. Look at the credits of TV shows. A serious drama about an alcoholic cop is normally written by one person. Comedy programs are much more likely to be written by two or three people. The reason is that if you’re working on something all day by yourself, it’s not too hard to remember what is tragic, but it’s a little tougher to get a good handle on what is funny. You might find yourself coming up with something you really like, then being struck by the thought that you’re the only person in the world who would find that amusing. You may be right. But if you’re with somebody else and you make that person laugh, then the chances of lots more people finding it funny are quite good. You laugh more and have more fun. Also, you have to split the money two ways. Swings and roundabouts. People get distracted. This was always true, but since Steve Jobs put a smartphone in everybody’s pocket, you’re fighting against that. The Internet. The single most distracting thing ever created. So you have to give people a good reason to carry on paying attention to whatever it is you’ve made. If you are writing a comedy script, this means making sure that each scene ends with some little twist, some compelling reason why somebody has to keep watching at least for another couple of minutes. If you keep doing that, they may even watch to the end. And then you’ve won. In books, particularly children’s books, which are read chapter by chapter and on consecutive nights, you have to do it by throwing in a little cliffhanger at the end of each chapter. Grab people! Intrigue them! Thrill them! And don’t let them go! Sometimes I think it’s much easier for people writing cop dramas. They just kill a teenager at the start of the episode, and that’s enough to keep people involved for the next hour. Comedy writers have to work harder. If you want to be funny, get an idiot in there. This isn’t an absolute rule, but it works, over and over again. Baldrick in Blackadder. Dougal in Father Ted. Doberman in the Phil Silvers show. You can make your own list of these I’m sure. In the King Flashypants universe I covered my bases by making sure there are two idiots– Megan the Jester, and Globulus, the evil emperor’s assistant. Double takes aren’t very funny. Don’t write them in. Nobody does them in real life. Falling over, on the other hand, nearly always works. Get someone falling over. Then standing up and falling over again. – You just don’t get it, do you? – Why are you telling me this? – But that’s what I’ve been trying to tell you! – (Person insults somebody else, then says…) He’s standing right behind me, isn’t he? Try to write stories where characters are forced into situations where they have to break their own self-imposed rules. That always works. It doesn’t hurt to have two or more projects on the go at the same time. When you’re stuck on one, you can go back to another. Go swimming or do some back exercises. Writing and drawing tends to be sedentary so it’s not good for your body. That said, there are ways around this these: I write the first drafts of my books by dictating them into Siri as I walk down the street. I’m dictating this blog entry right now, pacing around the kitchen. It’s better for your back, your hands, your shoulders. Keep your receipts. Writers and artists are notoriously bad at admin and paperwork. And anyone who says “find something you love to do and you never have to work a day in your life” probably never had to do their own tax returns. You do. Remember that lists of comedy tips get less useful once they have passed the halfway point. Listen to people on public transport. A fragment of conversation you pick up one might be the germ of an idea for a sketch, a book, a character, a show. It’s happened to me lots of times. However good you think you are, you will need some editing. I’ve had all kinds of editing on my books, TV shows and films – some incredibly good, some quite bad. You learn to value the really good ones. There is never a point where you’ve “made it.” It’s always a fight. And even if you do “make it,” you can and will fall out of favour again some time. A career in this sort of work is a marathon, not a sprint, though you do end up having to sprint a lot for deadlines. It’s a sprinty marathon. You might make money, you might not, but so long as you’re getting into it for the right reasons – because you like turning out this kind of work – you’ll be able to weather the tough times. Don’t work all the time! Look after yourself. Learn how to knock off. Feel free to ignore any or all of these guidelines if something is really working. Because that’s what counts, really.